The Trans Mountain Pipeline is owned by Texas company Kinder Morgan and has been in operation since 1953. The 715-mile-long pipeline runs from Edmonton, Alberta to Burnaby, British Columbia. It carries refined products, synthetic crude oils, and light crude oils, and is the only pipeline system in North America that transports both crude oil and refined products, such as jet fuel, to the West Coast. The current capacity of the Trans Mountain Pipeline is 300,000 barrels of oil per day, which Kinder Morgan hopes to triple with a newly proposed expansion pipeline (TransMountain). Kinder Morgan plans to nearly triple the volume of the Trans Mountain Pipeline from 300,000 barrels per day to 890,000 barrels per day by 2019. In the proposed route, 73% of the pipeline will run along the right-of-way along the existing pipeline, 17% will run along other existing infrastructure, and 10% will run along a new right-of-way. The expansion project also includes 12 new pump stations and 20 new tanks onto existing storage terminals. The expansion project is expected to cost $5.4 billion (TransMountain). The existing pipeline already runs through parks, including eight parks and protected areas in British Columbia. Four parks and one protected area interfere with the proposed expansion, and Kinder Morgan has submitted boundary adjustment applications to build in these areas (TransMountain). The new pipeline would carry bitumen, which is a heavy, viscous material that must be diluted to run like a liquid through pipelines (see Bitumen). It is diluted up to 30% and its chemical components are kept a trade secret. Diluted bitumen (dilbit) typically must be piped under higher temperatures and pressures, which raises the risk of pipeline failures. According to Conversations for Responsible Economic Development, “Studies have shown that land-based spills can contaminate groundwater for many years and at distances up to thousands of meters from the spill source” (CRED). The Trans Mountain Pipeline project has the potential to affect thousands of landowners along the proposed route. While Kinder Morgan says the project will remain within the existing right-of-way, that right-of-way does allow for expropriation of land along the edges if necessary (Pipeline Observer). Coast Salish tribes and First Nations are among those who will be affected by the pipeline expansion including the Swinomish Indian Tribal Community, Tulalip Tribes, Lummi Nation, and Suquamish Tribe in Washington State, and the Musqueam, Squamish, and Tsleil-Waututh First Nations in British Columbia (Earth Justice). “In British Columbia, we cross numerous traditional territories and 15 Indian Reserves. Where the pipeline crosses Indian Reserves in British Columbia, we contribute to each First Nation via property taxes on the land occupied. We consider ourselves neighbours to these Aboriginal communities and we respect their unique interests in the land, their values and their culture” (TransMountain). Indigenous people have been pressured for a long time by the Canadian government to give up land rights in favor of fossil fuel expansion, but many First Nations in Canada and tribal communities in the United States have been actively opposing the Trans Mountain Pipeline expansion (Lukacs). Edmonton is home to the Kinder Morgan Terminal and Refinery. It has a population of 877,900 and has shown a strong growth in population since the Tar Sands boom began. Since 1950, there has been an increase of 729,100 people in Edmonton. The City of Edmonton gets its drinking water from the North Saskatchewan River watershed. Kinder Morgan’s terminal and refinery sits next to the Saskatchewan River, which flows through the middle of Edmonton and eventually empties into the Hudson Bay (EPCOR). An oil spill in Edmonton has the potential to affect millions of people’s drinking water. The Kinder Morgan Refinery in Edmonton, Alberta. Note how close it is to the Saskatchewan River (top left) (Credit: Tychnowicz). The Tsleil-Waututh First Nation, on Burrard Inlet in North Vancouver, is known as the “People of the Inlet.” Since their land was never ceded, they have many battles with the government regarding land rights and use. Many communities and businesses have settled on their traditional land, which includes Vancouver and Burnaby. Tsleil-Waututh is a leading First Nation in the fight against the Kinder Morgan Trans Mountain Pipeline expansion project (Tsleil-Waututh Nation). The traditional area of the Tsleil-Waututh Nation, which includes Vancouver and Burnaby, B.C. (credit: Tsleil-Waututh). The Tsliel-Waututh Nation is actively opposed to the Trans Mountain Pipeline and has received much media attention for its role in the movement against the pipeline expansion project. It formed The Sacred Trust Initiative to fight the project. Rueben George is a prominent leader and spokesperson for the Nation, and has participated in many protests and marches against Kinder Morgan (Canadian Press). In 2015, the Tsleil-Waututh Nation rejected the National Energy Board’s review of the Trans Mountain Pipeline, and released its own assessment (Sacred Trust Initiative). Kinder Morgan’s Westridge Marine Terminal, the ending point of the Trans Mountain Pipeline, is located in Burnaby, British Columbia next to Vancouver (see Burnaby Oil Terminal). Burnaby Mountain has been an important location in the Trans Mountain Pipeline debate, and hosted major protests in 2014. Kinder Morgan has plans to burrow its pipeline through Burnaby Mountain, which would disrupt a park, houses, and Simon Fraser University. Burnaby Mayor Derrick Corrigan has been openly opposed to the pipeline expansion project. An incident in November, 2015 exposed the existing pipeline on Burnaby Mountain after heavy rain caused the slope to be unstable. This deepened concerns of citizens of an oil spill in the urban area (Prystupa, 2015). The 2014 protests on Burnaby Mountain were a reaction to the Trans Mountain Pipeline expansion project and the plan to route the pipeline through Burnaby Mountain, on which there is a conservation area and Simon Fraser University (Dawson). The main goal was to stop the company’s exploration work on the mountain, since Kinder Morgan was test drilling before the application for the expansion project was accepted. Many protesters camped out in tents and there were over 100 arrests. Several protesters were individually sued for millions of dollars for prohibiting Kinder Morgan’s work (Frid). Alejandro Frid, a conservation ecologist who does marine research for the Central Coast Indigenous Resource Alliance, was arrested at these protests. In an interview, he explained the wide range of people who attended, including environmentalists, Burnaby residents, scientists, Indigenous people, academics, elderly, parents with children, and professionals (Frid). Burnaby Mayor, Derek Corrigan, and Vancouver Mayor, Gregor Robertson, are both openly opposed to the Kinder Morgan pipeline expansion. Mayor Corrigan attended an anti-pipeline rally on Burnaby Mountain, stating that he would be willing to get arrested if it meant halting the pipeline from entering Burnaby (Moreau). The City of Burnaby sued Kinder Morgan for trespassing on Burnaby Mountain, and in November 2015, the court ruled that National Energy Board laws trump city bylaws, and the City of Burnaby was ordered to pay the court costs of Kinder Morgan (Drews). Mayor Robertson of Vancouver has voiced his objections to the Trans Mountain Pipeline expansion, saying “…we heard overwhelming evidence that the Kinder Morgan pipeline proposal and the oil tankers associated with it are incredibly disastrous for Vancouver” (Kane). The pipeline expansion would increase oil tanker traffic in the Salish Sea more than four-fold, thus increasing the risk of an oil spill in a major salmon and orca migration zone. Oil spills are a major concern since they lead to major health, environmental, and economic impacts (CRED) (See Oil Tanker Spills). “The fishing grounds of the Salish Sea are the lifeblood of our peoples. We cannot sit idly by while these waters are threatened by reckless increases in oil tanker traffic and increased risk of catastrophic oil spill” (Earth Justice). One concern with an oil spill is the time it would take to begin clean-up. The Canadian government closed the oil spill response center in British Columbia, centralizing spill response to Quebec, 3,000 miles away (Vancouver Sun). For information on first responders and cleanup, see Health Workers. “…in Canada none of these coastal First Nations have signed any treaties, so…all of these developments are basically on unceded territory. They are in direct violation of Indigenous rights unless they have prior consent” (Frid). Other opponents are more concerned with the bigger picture of the expansion of fossil fuels, which leads to climate change and warmer and more acidic oceans. Extraction of bitumen from the Alberta Tar Sands (the source of bitumen) produces toxic waste, which seeps into groundwater (See Alberta Tar Sands). Along with causing high cancer rates of local residents, the expansion of the Alberta Tar Sands is also causing a decrease in wildlife, particularly detrimental to Natives who hunt for food. The caribou population, for example, has been decreasing at an alarming rate (Indigenous Environmental Network). In July 2007, a road crew's excavator pierced the Kinder Morgan pipeline, causing a massive rupture. 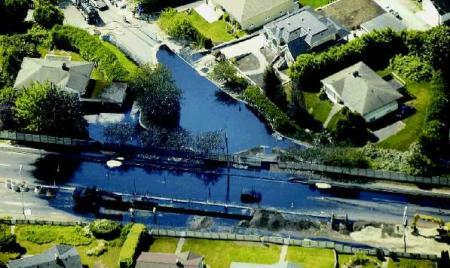 More than 250,000 liters of oil spilled into a Burnaby neighborhood and 70,000 liters into Burrard Inlet. The image of houses, cars, roads, and lawns coated with thick crude oil spread through international media. Roughly 250 residents had to be evacuated and $15 million was spent on clean-up, which took more than a year (CRED). In 2014, Kinder Morgan was heavily criticized for accidentally omitting pipeline maps in its federal application. The maps were finally supplied after the four-week period ended when the public was applying to participate in the upcoming NEB hearing. When Parliament was asked to force Kinder Morgan to re-start its application, the request was ignored (Prystupa, 2014). Since 1961, the company has experienced 82 spills. 69.5% of Trans Mountain’s past spills have occurred at pump stations or terminals, and the remaining 30.5% of spills have occurred along the pipeline, with 21 incidents related to releases of crude oil from the pipeline (TransMountain). At Burnaby Mountain, Kinder Morgan has repeatedly sued individual protesters for millions of dollars, using unreasonable lawsuits called SLAPP suits (Frid). A Strategic Lawsuit Against Public Participation (SLAPP) intends to intimidate and silence the opposition by burdening opponents with the high cost of a legal defense until they abandon their criticism (Sheldrick and Gandesha). Along with criticism of the proposed pipeline expansion, many residents have criticized the methods of the National Energy Board. It has been called “fraudulent,” “a sham,” and a “public deception.” The regulations and lack of transparency of the National Energy Board’s process with the Trans Mountain pipeline expansion has made it increasingly difficult, and sometimes impossible, for intervenors to get information on the project (Linnitt). Kinder Morgan, and other supporters of the expansion of the Alberta Tar Sands, claim that the economic benefits of the pipeline expansion outweigh the environmental risks. The expansion project would create 50 permanent jobs, an estimated two years of temporary jobs during the pipeline’s construction, and 4,500 construction jobs at the peak employment. Kinder Morgan states that governments will see $23.7 billion in taxes and royalties from the running double pipeline. Kinder Morgan’s website has a page dedicated to Aboriginal benefits of the pipeline expansion, which include job and training opportunities and funds for a variety of community projects (Kinder Morgan). Communities along the proposed pipeline route have many economic and environmental concerns with the project. One economic concern is the cost associated with infrastructure necessary for Kinder Morgan to work on the pipeline. Roads would need to be built and maintained since the large trucks and increased traffic can quickly deteriorate roads. According to a study by Associated Engeneering and commissioned by five municipalities (Burnaby, Surrey, Coquitlam, Abbotsford and the Township of Langley) the cost of operating, maintaining and replacing city infrastructure around the proposed pipeline would be $93 million over 50 years (Moreau). Another argument against this expansion project is that the oil is not being extracted for use by Canadians; 71% of the oil shipped via pipeline in 2010 was exported (CRED). One major financial concern with the Trans Mountain pipeline is oil spills, which can cost tens of millions of dollars to clean up. A large spill could also ruin many jobs in industries such as tourism, fishing, agriculture, and real estate. A spill would also be financially devastating for Indigenous people. It would harm their economy, way of life, and their food sources. Some argue that British Columbia would most likely bear the brunt in the case of a pipeline or tanker spill (CRED). “Tar sands operations are licensed to divert 652 million cubic meters of fresh water each year, 80% from the Athabasca River. In comparison, this amounts to approximately seven times the annual water needs of the city of Edmonton. About 1.8 million cubic meters of this water becomes highly toxic tailings waste each day” (IEN). Former Prime Minister Stephen Harper’s government was very pro fossil fuel expansion. Alejandro Frid referred to the previous Conservative government as “fossil fuel cheerleaders.” The previous government put much energy into pressuring First Nations to support the expansion of the Alberta Tar Sands, and it received strong resistance (Lucaks). The new Liberal Prime Minister, Justin Trudeau, has attracted both hope and criticism around him and pipeline projects. During his campaign, he spoke in support of environmentally sustainable projects and green energy, but as Prime Minister, he has pushed for the Keystone XL pipeline and the Trans Mountain pipeline expansion, stating, if it is done in the "right way that is sustainable, that has community support and buy-in, and that fits into a long-term strategy of not just a sustainable environment but a sustainable economy” (Euchi). Currently, the Canadian government still supports the Trans Mountain pipeline expansion project and expanding the Alberta Tar Sands, despite major opposition from First Nations, towns and cities, environmentalists, scientists, and scholars. In May 2016, the National Energy Board issued a report recommending that the government approve the Trans Mountain Expansion Project, subject to 157 conditions (National Energy Board). Opponents vowed to keep fighting to stop the expansion (Ausick). Ausick, Paul (2016, May 20). Plenty of Opposition Remains to Kinder Morgan Canadian Pipeline Expansion. 24/7 Wall St.
Canadian Press. (2015, May 26). Kinder Morgan's Trans Mountain pipeline rejected by Tsleil-Waututh First Nation. CBC News. Conversations for Responsible Economic Development. (2013, February). Assessing the risks of Kinder Morgan’s proposed new Trans Mountain pipeline. Conversations for Responsible Economic Development. Dawson, C. (2015, March 3). Kinder Morgan’s oil pipeline plan hits mountain. Wall Street Journal. Drews, K. (2015, November 24). Burnaby Loses Trans Mountain Court Battle, Ordered to Pay Company’s Costs. Vancouver Observer. The Canadian Press. Earth Justice. (2014, February 13). Kinder Morgan Pipeline threatens ecology and economy of Salish Tribes. Earth Justice. EPCOR Water Services Inc. (2010, May). Edmonton’s water supply. EPCOR. Frid, A. (2015, November 28). Personal Interview. Indigenous Environmental Network. Tar Sands. IEN. Kane, L. (2015, May 27). Trans Mountain pipeline expansion 'disastrous,' says Mayor Gregor Robertson. Canadian Press. Linnitt, C. (2015, January 22). Kinder Morgan Pipeline ruling weakens faith In NEB. Huffington Post, Canada. Lukacs, M. (2015, March 23). Canadian government pushing First Nations to give up land rights for oil and gas profits. The Guardian. Moreau, J. (2015, June 23). Kinder Morgan pipeline expansion would cost cities $93 million: Report. Business Vancouver. Moreau, J. (2014, October 15). Kinder Morgan vs. the City of Burnaby: A case of dueling letters. Burnaby Now. National Energy Board (2016, May 19). Trans Mountain Pipeline ULC - Trans Mountain Expansion, Filing A77045. Pipeline Observer. (2014, March 1). The National Energy Board and ‘Public Interest. Pipeline Observer. Prystupa, M. (2014, February 26). Kinder Morgan slammed for 'accidentally' omitting oil pipeline maps in federal application. Warrior Publications. Prystupa, M. (2015, November 2). Burnaby mayor irritated by Kinder Morgan pipeline exposure. Vancouver Observer. Prystupa, M. (2015, November 9). Transition Alberta off oil sands, climate thinkers urge Trudeau. National Observer. Sacred Trust Initiative. (2015, May 26). Tsleil-Waututh Nation release landmark independent assessment of Kinder Morgan Trans Mountain proposal. Twnsacredtrust. Sheldrick, B. & Gandesha, S. (2014, November 26). BC pipeline protest case shows how lawsuits threaten democratic voices. Broke Pipeline. Tsleil-Waututh Nation (2016). About TWN. Uechi, J. (2014, February 26). Justin Trudeau favours Kinder Morgan expansion approval (if it's 'done right'). Vancouver Observer. Vancouver Observer. Kinder Morgan Pipeline. Vancouver Sun. (2012, April 20). Federal government closing oil-spill response centre. Canada.com.